My own Cloud Cosmology begins with a first action and near exponential expansion that is time and volume dependent in the three dimensional world. The first action produces a neutral neutrino and a sphere of complex curvature producing geometry capable of decaying into additional neutral neutrinos on an ongoing basis. I call this the first tier of matter and it is plausible that it is continuously producing new neutral neutrinos at a decaying rate. 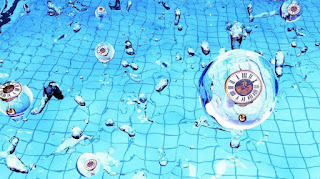 Thus the first tier of matter may be considered as the tier of continuous creation. I propose this conjecture because is it plausible and i see no reason why not. However this also makes the age of the universe problematic. Yet the individual neutral neutrino also effects zero gravity until it lines up with at least one other neutral neutrino. Thus the first tier of matter is not a source of gravity as we measure it. That is left mostly to the second tier as posted elsewhere. All this makes time extremely interesting. The universe appears to be 13.9 billion years old but that may be the length of its natural internal cycle between creation and internal consumption in which both neutral neutrinos and information in the form of photon strips are used up. Universal conspicuousness is thus contained, made perceptive and immortal at the same time. It experiences time to be perceptive but conscious understanding of immortality never ceases. This is a fresh take on my developing ideas on time and subject to rewording and deeper understanding.. .
New research suggests that oscillating heavy particles generated "clocks" in the primordial universe that could be used to determine what produced the initial conditions that gave rise to the universe. How did the universe begin? And what came before the Big Bang? Cosmologists have asked these questions ever since discovering that our universe is expanding. The answers aren't easy to determine. The beginning of the cosmos is cloaked and hidden from the view of our most powerful telescopes. Yet observations we make today can give clues to the universe's origin. 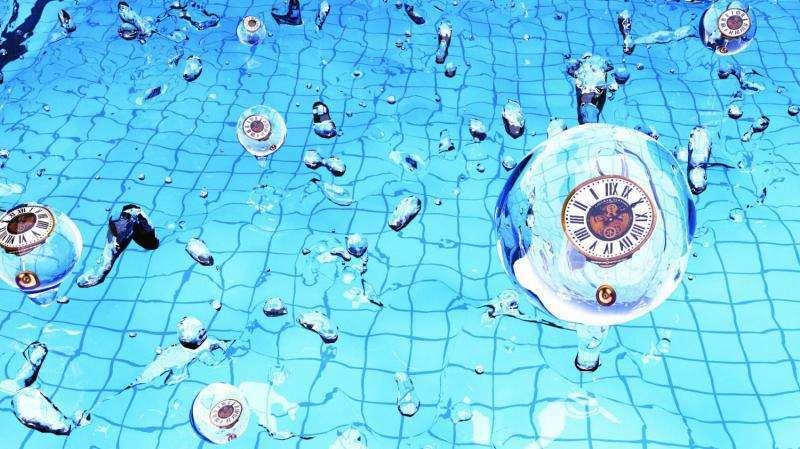 New research suggests a novel way of probing the beginning of space and time to determine which of the competing theories is correct. One promising source of information about the universe's beginning is the cosmic microwave background (CMB) - the remnant glow of the Big Bang that pervades all of space. This glow appears smooth and uniform at first, but upon closer inspection varies by small amounts. Those variations come from quantum fluctuations present at the birth of the universe that have been stretched as the universe expanded. The conventional approach to distinguish different scenarios searches for possible traces of gravitational waves, generated during the primordial universe, in the CMB. "Here we are proposing a new approach that could allow us to directly reveal the evolutionary history of the primordial universe from astrophysical signals. This history is unique to each scenario," says coauthor Xingang Chen of the Harvard-Smithsonian Center for Astrophysics (CfA) and the University of Texas at Dallas. While previous experimental and theoretical studies give clues to spatial variations in the primordial universe, they lack the key element of time. Without a ticking clock to measure the passage of time, the evolutionary history of the primordial universe can't be determined unambiguously. "Imagine you took the frames of a movie and stacked them all randomly on top of each other. If those frames aren't labeled with a time, you can't put them in order. Did the primordial universe crunch or bang? If you don't know whether the movie is running forward or in reverse, you can't tell the difference," explains Chen. This new research suggests that such "clocks" exist, and can be used to measure the passage of time at the universe's birth. These clocks take the form of heavy particles, which are an expected product of the "theory of everything" that will unite quantum mechanics and general relativity. They are named the "primordial standard clocks." "Ticks of these primordial standard clocks would create corresponding wiggles in measurements of the cosmic microwave background, whose pattern is unique for each scenario," says coauthor Yi Wang of The Hong Kong University of Science and Technology. However, current data isn't accurate enough to spot such small variations. Ongoing experiments should greatly improve the situation. Projects like CfA's BICEP3 and Keck Array, and many other related experiments worldwide, will gather exquisitely precise CMB data at the same time as they are searching for gravitational waves. If the wiggles from the primordial standard clocks are strong enough, experiments should find them in the next decade. Supporting evidence could come from other lines of investigation, like maps of the large-scale structure of the universe including galaxies and cosmic hydrogen. And since the primordial standard clocks would be a component of the "theory of everything," finding them would also provide evidence for physics beyond the Standard Model at an energy scale inaccessible to colliders on the ground. This research is detailed in a paper by Xingang Chen and Mohammad Hossein Namjoo (CfA/UT Dallas) and Yi Wang (The Hong Kong University of Science and Technology). It has been accepted for publication in the Journal of Cosmology and Astroparticle Physics and is available online.